Last year, Garry Starr told us all what an amazing actor he is in Garry Starr Performs Everything. This year, he returns to tell us how to be an amazing actor just like him. In Garry Starr Conquers Troy, Garry takes us through his new book, step by step and chapter by chapter with hints and tips on how to break into Hollywood and have every agent and director banging on our door. Garry (performed by Damien Warren-Smith) has lost some of his arrogance this time round, but not of all it. He is still deluded about his triple threat performance skills but he is earnest in his effort to help his fellow actors out. We are provided with lessons on a range of topics, including how to audition for a director when we are work without them even realising what is happening, and there's also a spot on how to absorb our lines from a script and never have to worry about forgetting them. 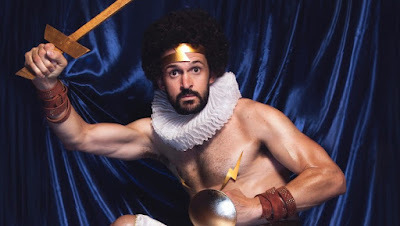 The show is full of literary and film callbacks and Warren-Smiths's impressive word play and puns, and his ability to bring two opposing references of pop culture, mythology or history together (Mr. Ed and the Trojan War) is the perfect complement to the physical comedy and clowning that is also present. As with his debut show, audience participation has a vital role here but Warren-Smith's playful nature and vulnerability as Garry ensures that people are happy to join on him stage. He is clearly comfortable with being Garry almost to the point it feels like it might an extension of himself, and he is able to improvise with the audience when reactions are not what he expected. If you ever wanted to do good acting or just curious to see what good acting entails then this is a masterclass you should probably avoid. However, if you want to see some side-splitting comedy with brilliant character work, then Garry Starr Conquers Troy is the show you don't want to miss.